Even though Acura makes dependable vehicles, transmission slipping, poor shifting, shudder or skipping are some problems that owners often face. These Acura transmission problems can start as early as 60,000 miles and are typically noticeable in cold weather and during warm up. Certain Acura transmission problems can be fixed by updating the transmission software which can be completed by any Acura dealer. In other cases, a complete transmission replacement may be required. If your Acura is still under factory warranty the repair will be fully covered by the dealer. If you don't have vehicle warranty typical cost to replace an Acura transmission can vary from $2000 to $5000. In this guide, we will go over some basic things you need to check if you are experiencing problems with your Acura transmission. How to read fault codes from the Transmission Control Unit (TCU) / Powertrain Control Module (PCM) yourself. There are a few things that need to be checked first before you or your mechanic decide to change the transmission. If your Acura is stuck in gear or you notice a delay in shifting, the first thing that you or your mechanic needs to check is transmission fluid level. When the transmission fluid level is low you will experience symptoms such as transmission slipping, no shift, jerking between gears or even a burning smell. Do not drive an Acura with low transmission fluid because that will cause damage to the transmission. First check there is at least some amount of transmission fluid. Drive your Acura around for at least 15 minutes. Make sure to manually shift the transmission between all the gears if necessary. This will allow your Acura transmission fluid to reach operating temperature. Check automatic transmission level. Transmission fluid level should only be measured when the transmission oil is warm to get an accurate level reading. If the transmission fluid level is low, add trans fluid until you bring the level between the min and max marks on the dipstick. If your Acura does not have a dipstick, you can purchase one from the dealer. Or check online for Acura Transmission Dipstick. Transmission oil dipstick may not be available for transmissions where the level is measured via the drain plug or that have a fill and drain plug. Add transmission fluid. Only use the recommended oil by Acura, Honda transmission fluid. Using any transmission oil can cause damage to the transmission. Below is a list of the most used Acura transmission fluid and applicable vehicles. Acura ILX 2013-2014 Hybrid; L4; 1.5L; LEA2 Eng. The first sign that you may be having transmission problems is that the check engine light (CEL) comes on. You can use a generic code reader to retrieve CEL codes but those codes will not be as helpful as the codes that are stored in the Powertrain Control Module (PCM) module (also known as transmission control unit). When you take your car to the dealer fault code reading from PCM is the first diagnostic step performed. You can purchase a relatively inxpensive multi-system diagnostic scanner online and diagnose your Acura transmission yourself. Here are a few Acura/Honda Transmission Scanners that can help you diagnose your Acura/Honda transmission problem. Locate OBD-2 port under the dashboard on the driver's side. This is a 16-pin port. All 1996 and newer ACURA vehicles have this port. Plug in your handheld scanner or Bluetooth adapter into the OBD2 port. Turn key to position II. All the dashboard lights will turn on. Do not start the vehicle. If your ACURA has Start/Stop button you will need to press the Start button without pressing the brakes. 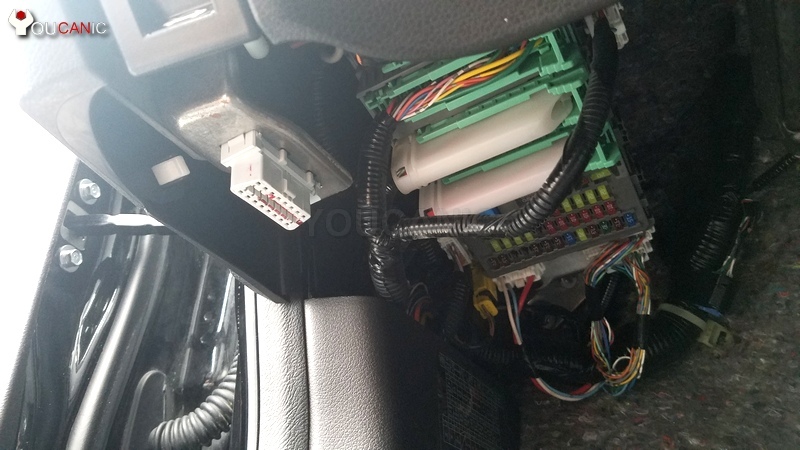 Allow the OBD2 scanner to turn on and connect to your ACURA Engine Control Unit (ECU). Read fault codes from the Transmission Control Unit also known as Powertrain Module. Write down the fault code and do research online to find out more about the problem and possible solutions. Once the problem is fixed you can go to Transmission menu > Erase Codes to reset the transmission fault codes. A common problem that affects many Acura (such as TL and MDX) is transmission shudder and vibrations when driving. The vibrations can be most felt at highway driving speeds. This problem may be corrected by updating the software for the automatic transmission which has to be completed by the dealer. Call the Acura dealer provide them with your VIN number and ask if there is a Powertrain Control Module (PCM) software update available. If a software update does not fix the shudder, there is a good chance that you have a bad torque convert which needs to be replaced. To replace the torque converter the transmission needs to be removed which makes this repair very expensive. This is not an easy DIY fix that you can perform on your driveway. Typical cost to change the torque converter is $1800-$3000. Check engine light and D4 or D5 indicator on the dashboard on your instrument cluster may flash. In some cases, you may even hear a loud noise from the transmission. When this happens, your Acura transmission will delay shifting between gears in upshifting and downshifting. To fix this problem often a new torque converter is needed. Honda extended the warranty to fix this problem but older Acuras now fall outside of the warranty period. Read the fault codes from the Engine Control Unit. Read fault codes via the OBD2 port located under the dashboard using a Level 1 OBD2 scanner. Another problem that can affect some Acuras is that the 3rd gear clutch pack may wear prematurely. If this happens, you may have issues upshifting or downshifting in 3rd gear. Typical problems include flaring, slipping or no shifting to third gear at all. Check engine light (CEL / MIL) and gear D5 may also be flashing. To fix this problem you will need to overhaul the transmission and replace the 3rd gear clutch. Similar symptoms can also be caused by a defective valve body. Multiple solenoids are mounted on the valve body of the Acura transmission. Due to age these solenoids can fail or get sticky causing erratic shifting. Sensors mounted on the valve body can get dirty or stop working if there is a short in the wire harness. It is possible to overhaul the valve body instead of replacing it. Valve body repair kits are available and less expensive than replacing the whole valve body. See Acura Transmission Valve Body Kit. It can be scary if your Acura shifter won't move out of Park. Not only are you stuck in a parking lot or garage but now you are worried about an expensive car repair. Don't panic because this problem is not as bad as you may think. The problem is caused by a bad brake light switch or the ignition switch is not releasing the shifter from park. As a temporary solution manually override the transmission and move the shifter in Drive. Next to the shifter, you will notice a small plastic cover that says Shifter Unlock. Use a small object such as a flat screwdriver or pen to remove the cover. Insert the screwdriver into the hole and move the shifter from Park to Drive. Over the years Acura has issued multiple recalls for the automatic transmission. The best thing to do is to get your Acura VIN number written down and call any Acura dealer. Provide them with the VIN and ask if there are any recalls on the car. If there are, the dealer will fix your Acura for free. List of a few Acura recalls and service bulletins. A judder from the torque converter lock-up clutch may be felt while driving between 20–45 mph. To minimize the opportunity for the judder to occur, a software update for the transmission is available. While driving, the D4 indicator (1999 3.2TL) or D5 indicator (all other models) on the instrument panel flashes. An abnormally loud noise from the transmission. Extremely slow or delayed gear engagement, upshifts, or downshifts. Abnormal gear slippage during upshifts or downshifts. Erratic or excessively harsh shifting. Automatic transmission fluid (ATF) leaks. 1996 Acura NSX 4at transmission, coming home the paddle shifts quit working and in drive the car will only go in 2dn and 4th gear. Even if you manually try to shift only second and forth. Seems to be a relay, fuse?